The CityLYNX Gold Line and the LYNX Blue Line will be out of service per the above dates for track work. There will be NO train or streetcar service on the dates above. To see available public transportation options during this time, please visit the City of Charlotte website. • Cross only at designated crosswalks. There are clearly marked signs showing you safe areas to cross the street. If you see the streetcar coming, wait for it to pass before you cross. • Stay Alert. Look up from your phone. Take out your ear buds or turn the volume down. Remember, safety starts with you. Look, Listen and Live! 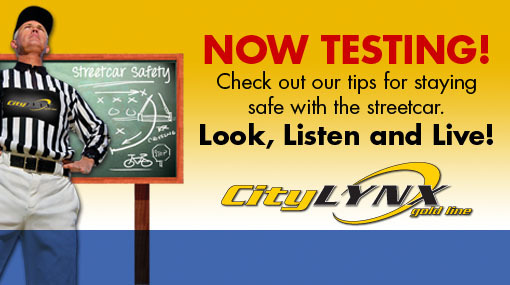 CATS Now Testing for the New CityLYNX Gold Line; Watch Podcast for a Free T-shirt! CATS is now testing for the new CityLYNX Gold Line. Your safety is our #1 priority. Use the information below or watch the City of Charlotte’s online safety podcast (and earn a FREE T-shirt!) to stay safe on and around the streetcar system. Streetcars run in the same travel lanes as other vehicles. Listen for whistles, bells or horns. It is ok to drive on the streetcar tracks. Stay alert! Streetcars cannot stop as quickly as you can. Streetcars traveling at 16 mph take almost 100 feet to stop. Streetcars cannot swerve out of the way of pedestrians, cyclists or vehicles. It is your responsibility to stay out of the streetcar’s path. Obey all traffic signs and signals. They are there for your safety, not as an inconvenience. Cross only at designated crosswalks. There are clearly marked signs showing you safe areas to cross the street. Do not cross the street in front of a streetcar. Even if the streetcar is stopped. Wait for the streetcar to pass before you cross. Safety starts with YOU! Report all suspicious packages, activities, and/or persons on the streetcar. Park your entire vehicle within the solid white parking lines. Incorrectly parked cars will be subject to a citation and towing. Look for streetcars before making a right turn at a red light. Streetcars are quiet and you may not hear them coming. Follow the streetcar at a safe distance. Be prepared to stop. Cross tracks at a right angle or walk your bike across. Cyclists are more likely to get their wheels stuck or crash when crossing the tracks at an angle of less than 90 degrees. Wet tracks can be slippery. Take caution. Sometimes it’s safer to walk your bike across. Use the green bike boxes to make left hand turns. Never enter an intersection against the traffic signals. Be aware of the door zone. This is the space occupied by an open door between moving vehicles and parked cars. * A limited number of T-shirts are available, so watch the podcast today to ensure you receive yours. Improvements continue to be made to the CityLYNX Gold Line, the City of Charlotte’s street car project. Construction crews have energized the overhead catenary system, which provides electricity to power the streetcar through a pantograph at the top of the railcar. While power will be supplied overhead to the streetcar, the rails in the street will not be energized. Citizens can continue to drive, walk and bike across the city’s streets as normal. 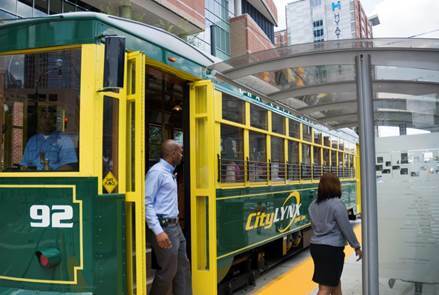 The CityLYNX Gold Line is scheduled to begin passenger service by summer 2015.